"The ACT did not have an official flag prior to the adoption of its new flag by the ACT Legislative Assembly on 25 March 1993. The reason for its long 'flaglessness' is simple: it was thought by a number of successive Commonwealth Governments that the ACT should represent all Australia and that the adoption of a specific territorial flag might necessarily detract from its federal representativeness. However, the lack of an identifying flag caused a number of problems. For example, the people of the ACT were singular in not having a unifying official community symbol and this also meant that their sporting teams were not readily identifiable. It was also thought that a flag would give the community as a whole a higher profile. The ACT achieved self-government only relatively recently, pursuant to the Australian Capital Territory (Self-Government) Act 1988 (Cth). This event undoubtedly enhanced official recognition of the ACT's 'personal identity' and paved the way for the adoption of its own particular territorial flag. Competitions for a new flag were held in 1988 and 1992 and a large number of submissions were received. No consensus was reached within the community regarding any particular design; however, there were some common features among the entries. These elements were incorporated into four base designs, which were informally chosen by members of the Legislative Council, and thereafter presented to the ACT community in February and March 1993. The residents of the ACT were then invited to take part in the selection process of the new flag by informal, non-mandatory vote. Residents were asked to register their choice, by mail or phone, of one of the four base designs. Option A was a dark blue flag with a golden Southern Cross set in the hoist. Option B was a stylised green and gold representation of the Canberra Hills with a Southern Cross in the upper hoist set on a dark blue sky. Option C was almost identical to Option B except that it also had a stylised royal bluebell (the ACT's official floral emblem since 1982) in the upper fly. Option D was the most popular choice and the flag that was ultimately adopted. The design of the new ACT flag was drawn by Mr Ivo Ostyn and was clearly inspired by the Northern Territory flag. The field is bicoloured, dark blue and deep golden yellow (the ACT's official sporting colours since 1985) at a ratio of 1:2. The smaller hoist panel is dark blue and carries a large white Southern Cross in constellation format; the four larger stars are seven-pointed and Epsilon is five-pointed. The Southern Cross is representative of membership of the Australian federation. The larger golden panel in the fly is emblazoned with a simplified version of the City of Canberra's Coat of Arms in the centre. The Coat of Arms is protected by the City of Canberra Coat of Arms Act 1932 (Cth). The Coat of Arms is a complex device and depicts a shield flanked by two swans, one dark blue and one white. The dark blue swan symbolises Australia in its native state and the white swan symbolises the introduction of the white English race. The shield itself carries five main designs: a triple-towered castle, which symbolises traditional dignity and the importance of the city; the sword of justice, which symbolises the executive power of the Commonwealth Government; the Parliamentary mace, which symbolises the law-making power of the Commonwealth Parliament; the Imperial Crown, which stands for the sovereign authority of the Commonwealth; and finally the Rose of York, which commemorates the part played by the Duke of York in the establishment of the Seat of Government at Canberra. The new flag is unfortunately not an entirely happy choice. The selection procedure by which the final four designs were chosen has been criticised by many ACT residents and the new flag itself has been described as the 'best of a bad bunch'. These criticisms are something for us to bear in mind when taking any future action regarding a new national flag, as they tend to confirm the concerns raised earlier in this chapter about the difficulties attendant on selecting a suitable design." 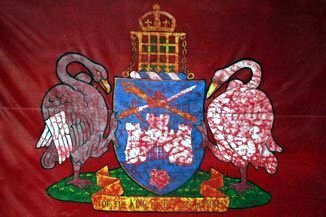 The creation of the Coat of Arms of the City of Canberra originated from a request by the Commonwealth Department of Defence to the Commonwealth Department of Home Affairs and Territories in July 1927. The request was made so that the Coat of Arms could be used on the newly commissioned ship, HMAS Canberra. In August 1927 the Federal Capital Commission (FCC) announced a competition to design a Coat of Arms for the FCC and for the City of Canberra. The chosen design, drawn by Mr C R Wylie, was sent to the College of Arms, London, in April 1928. After a few modifications, the Coat of Arms was granted by the College in pursuance of a Royal Warrant dated 8 October 1928. The Arms and a Crest were granted on 7 November 1928. This image is taken from the former flag of the City of Canberra in the Australian Capital Territory. According to "A Roll of Australian Arms" (Charles Low - Rigby Limited 1971) the actual Arms and Crest were granted, in pursuance of a Royal Warrant of 8 October 1928, by the Kings of Arms on 7 November, and Supporters by Garter on 9 November of the same year. The use of these Arms were originally governed by the "Federal Capital Commission's Arms Ordinance 1929", and then replaced by the "City of Canberra Arms Act 1932", under the authority of the Chief Minister of the A.C.T. since 1989. At a later date, not know to me, the arms were placed on a maroon field, to create a City flag. Previously, on 16 June 2009, I posted on the mailing list a photograph of this flag. This City flag also served as the unofficial Australian Capital Territory Flag until the formal adoption of an official A.C.T. Flag on the 25 March 1993.